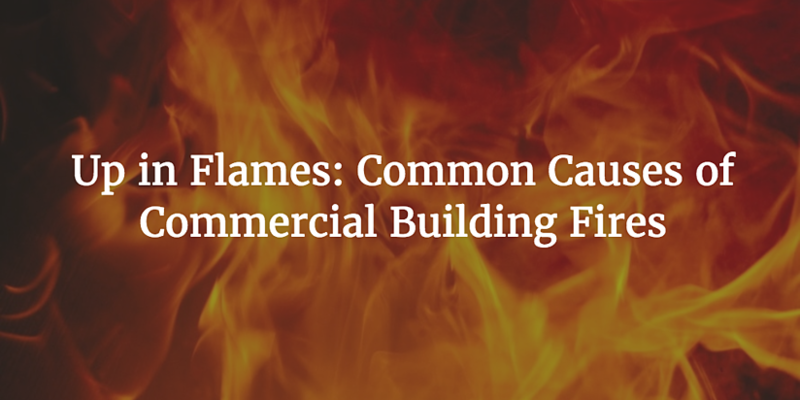 We usually don't think of a fire destroying our business or office building. Typically, we're worried about less concrete threats such as a downward trending economy, high customer churn rate, the struggle to retain talented employees, legal issues, etc. But the fact is that, between 2004 and 2013, nonresidential building fires killed 65 people, injured 1,425, and created $2,461,400,000 in damage. Learn what your business can do to prevent the most common ways that commercial building fires start. In order to prevent a dangerous and costly fire, let's take a look at when building fires are most likely to happen. This way, you can know when your business is most at risk, and what steps you can take to mitigate that risk. The time of day fires are most likely to occur in your building depends on what type of business you're in - an office building is a bit different from a manufacturing plant. For example, in office buildings, fires are most common during regular work hours. Incidence of fires peaks in the early evening hours between 3 - 6pm. Outside of the work day between 7pm - 7am, fires are 31% less common. Additionally, there are not many fires on the weekend days when office buildings are not in use. 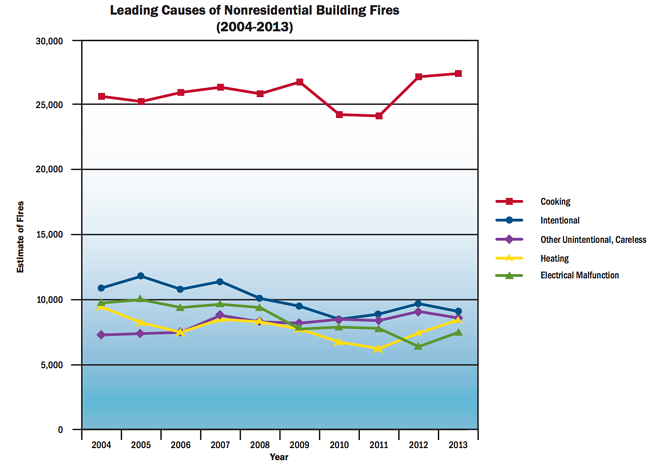 29.3% of nonresidential fires from 2013 were cooking related. In fact, 1 in 4 office building fires were related to cooking equipment. These fires tend to account for less damage, but are easily preventable with fire protection systems such as alarms and fire extinguishers. The second most common cause of nonresidential fires were intentionally started. This accounts for almost 10% of fires, and tends to cause the most damage. Intentional fires also result in more civilian injuries and deaths. Unlike cooking and heating fires, it's most common for intentional fires to be started between 3pm and midnight. Heating fires account for 9% of all nonresidential building fires. Central heating units, fireplaces, water heaters, and other heating appliances and systems should be regularly inspected to prevent fires. It's important to move any flammable materials and furniture away from heat sources, especially in the winter months when the heat is turned on. Run through the items below to see how protected your business is from a fire emergency. There might be something you're missing that could save you thousands of dollars in fire damage and loss. Fire extingusihers - The top cause of commercial building fires is cooking fires, and thankfully, most of these fires are small and contained. A fire extinguisher placed near the kitchen area can give employees the power to stop a small cooking fire from spreading. Make sure your employees are trained in using a few extinguisher. Read this if you're unsure whether or not your fire extinguishers are still in working condition. Fire alarms - This may sound obvious, but fire alarms are easily overlooked or left with dead batteries because they're not properly maintained. Not only is a fire alarm system required, but it can save lives and property from damage. Commercial fire sprinkler system - A sprinkler system can squelch a potentially deadly fire. The NFPA has no record of a fire killing more than 2 people in a building that was completely sprinkled. Having only 1 or 2 fire sprinkler heads can contain the majority of fires. So you have all of the necessary fire protection systems in place. But how well maintained and up-to-date are they? Do you have expired fire extinguishers? Are you following the legal state requirements for getting these systems tested regularly? Make sure you check the local fire code to see what is required of businesses, and set up regular inspections and maintenance. No ones likes to think that there are people who would intentionally start a fire on their property. Unfortunately, this is a scenario that you need to be prepared for. Invest in a security alarm system that will detect any suspicious activity in the evening hours when the building is most at risk. Keeping the area well-lit at night, or installing motion sensor lights outside, can deter criminal activity. You and your employees will appreciate the feeling of safety and security. Many companies also offer alarm monitoring services to ensure that your business is protected at all hours of the day and night. Hopefully you now have the information that you need to gather the products and services your business needs to protect itself from a crippling fire. Best of luck taking this important step!